Okay, here’s the plan. You live your whole life in this little town of several thousand people. You don’t go off to college, and you don’t seek an executive position with a fast-track company offering excellent chances for advancement. You just stay right here and work. You open a little place — nothing fancy or even very noticeable, not even on the main highway. 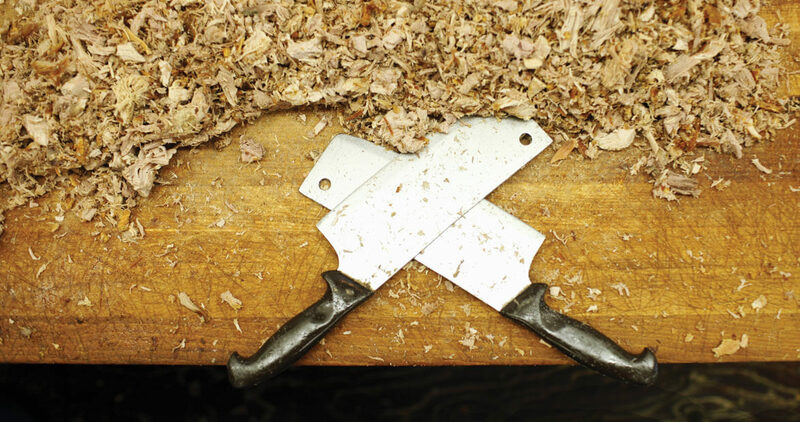 You put in day after day of long, inconvenient hours doing hot, dirty, greasy, back-hurting, splinter-in-your-finger, eye-stinging, foot-aching work. And you do it all again the next day. And the next. After thirty years, you’re famous in your field. You’ve received dozens of awards. You’re praised in national magazines and on network television. Presidents try your product and offer their compliments. And people from all over beat a path to your little, unsophisticated town — it calls itself “the Collard Capital of the World,” for Pete’s sake — just to buy your product. They even tell you they’re fixing to transport it halfway around the world, to Turkey or someplace. You’ve never had an advertising agency or public-relations campaign. Shoot, for years, you didn’t even have a sign out front. Just word of mouth. Ayden, located in Pitt County and twelve miles south of Greenville, is well known in the region for some state-championship-caliber 1-A football over at Ayden-Grifton High School. But the local team never pulled off a play as big as that. Something that unlikely, that American, could happen only in the world of barbecue, where the thing that matters ultimately is the verdict the public renders on your work. No use just to plan it or talk about it. You’ve got to produce — every day. Founder Walter B. “Pete” Jones (who never used the Walter B.) died in 2005. He never wanted to do anything else. 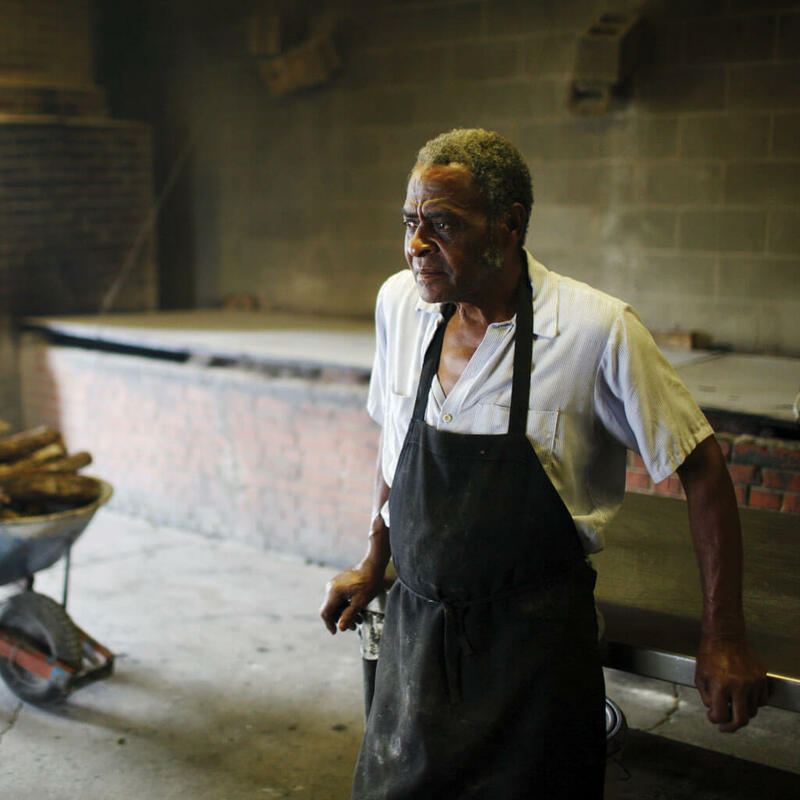 “I’d sit in school, as far back as the fifth or sixth grade, and daydream about having my own barbecue place,” he remembered. After high school, while acquaintances with stars in their eyes were daydreaming about little else but getting out of Ayden, Pete went to work cooking barbecue for his uncle, then he finally opened a business of his own in 1947. Nearly forty years later, he found someone to build a silver-painted, wooden dome — vaguely like the one atop the United States Capitol, but smaller — on top of his otherwise undistinguished, brick building. National Geographic had just identified his place as the barbecue capital of the world. Considering all his previous awards, and since the restaurant was a little off the beaten track, he figured he might as well make it easier for people to know this was the place. The capital. And really, you don’t come to The Skylight to experience change. You come for a barbecue sandwich on a bun, topped with yellow coleslaw. (It was many years before Pete stopped using plain, white loaf bread — light bread — in favor of hamburger-type buns.) 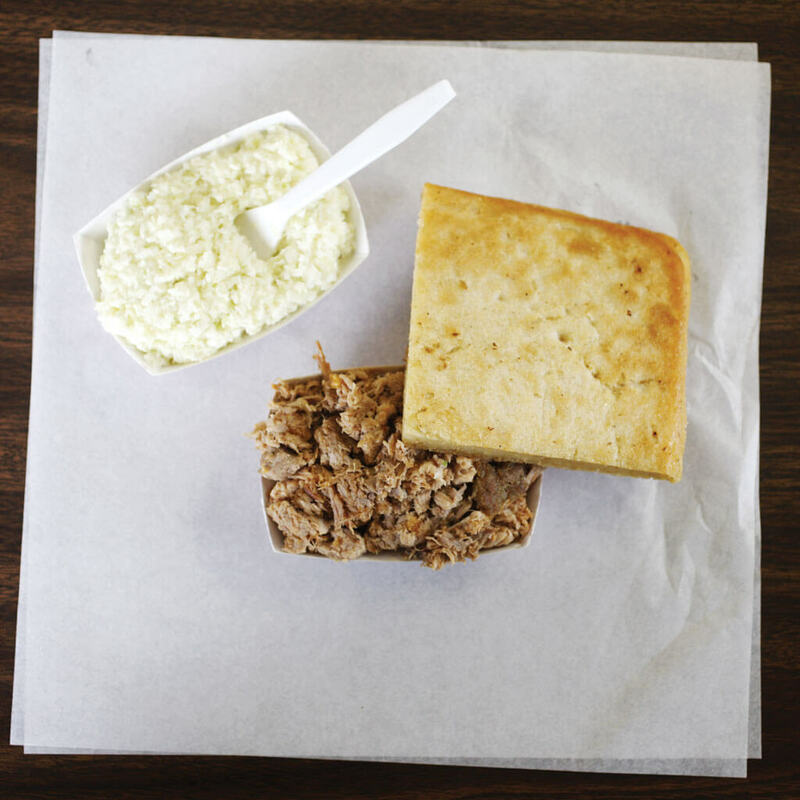 Or you come for a paper tray of chopped barbecue, a square slab of baked corn bread, and a little dish of slaw. That’s the way it’s served, too — tray of barbecue on the bottom, sheet of restaurant tissue, piece of corn bread sitting on top of that, more tissue, and the paper container of slaw with a plastic fork stuck into it on top of the stack.